ARLINGTON, Texas – Team Australia coach Troy Dunn has long been a boxing aficionado and famously used boxing matches as part of his team bonding experience for his team during training camp in preparation for the Sydney Global Cup. Dunn was certainly proud of his team’s fighting spirit on Sunday at the WinStar World Casino & Resort Global Cup USA, presented by Monster Energy, after they easily could have taken the 10 count on Saturday night. 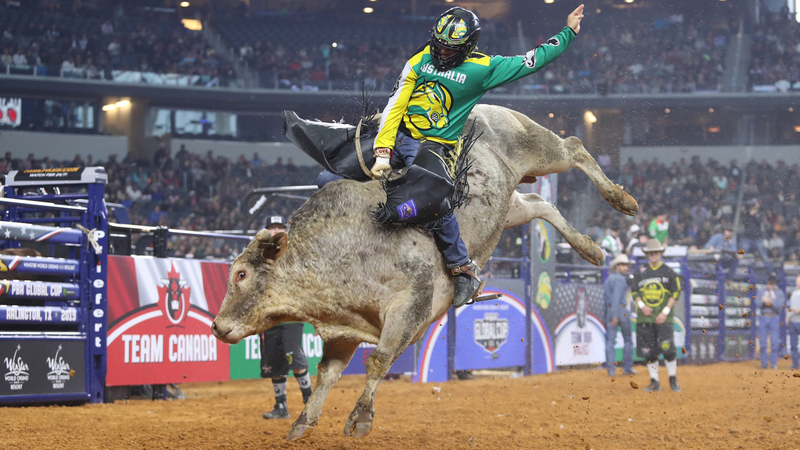 Team Australia went 4-for-9 to tie with event winner Team Brazil and the Team USA Wolves for the second-most qualified rides Sunday afternoon at AT&T Stadium. All four rides came consecutively for Team Australia, who went on to finish the Global Cup USA in fourth place (6-for-19). 19-year-old Brady Fielder got things started with 85.25 points on Whiskey River. Fielder was in the draw to replace Jason Mara, who injured his left groin Saturday night. Cliff Richardson reached 8 seconds on Clemmons Time for 85 points. Cliff’s brother Lachlan Richardson then connected on Real Gun for 88 points, while 2016 PBR Australia champion Cody Heffernan teamed up with The Don for 86.5 points. Lachlan led Team Australia as the only rider to cover two bulls. He covered Medicine Man for 86.75 points in Round 1. Richardson said he was proud of Fielder stepping up on the big stage in his first test on American soil against top-caliber bulls. The Australians may not have been able to finish in second place like they did in Sydney with home field advantage last June, but their ability to finish second in the long round Sunday is something to be proud of. It should be something to build upon for future Global Cups as well. “It’s kind of a different story when you’ve got these super rank bulls,” Dunn said. “It’s a bit of a combination of staying calm, but really scrounging around within yourself and digging deep and really bringing out that kamikaze in them.